The last career competition for the two-times Olympic champion Alexander Kurlovitch was at the Olympics in Atlanta. It was a disappointing performance - he took only the fifth place. After that he literally disappeared from the spotlight of public attention. And now in Athens I met Kurlovitch again. He is in amazing shape, there is a touch of grey in his hair and he wears an official referee's uniform. - What exactly do you want to talk about? - I left the sports the next say after the 1996 Olympics. I knew beforehand that I would end up my career in Atlanta regardless of the results I showed. I already turned 35. Of course, I wanted to leave weightlifting undefeated. Do you mean that after Barcelona you decided to stay in sports for another four years with this plan in your mind? No. I began training about three weeks after the 1992 Olympics. And then for a few months I was still thinking on how serious I should train... In Summer 1993, I was invited to German Bundesleague. I began to compete on a very frequent basis - once in a week or two. Surprisingly, I got back into a very decent shape. Did you consider that offer as a commercial opportunity only? On the one hand, yes. On the other hand, it was interesting. It was very different - the rules and the competitions were slightly different. By the way, I had an agreement with the Germans that I wouldn't have to max up my results. I had to lift 400 kilos in total and that was OK with them. But I got wound up. As a result, I was very prepared for the World Championship in Turkey and, when the weight classed were changed, I broke six world records. And then there was only two years left till Atlanta. I injured the hip muscle. I didn't lift for twenty five days. That's all. But I didn't feel sorry that I competed. You know it wasn't about that last injury of mine. In the last months before the Olympics, everything was going wrong for me. The age was showing - joints are not the same, muscles are not that flexible. What happened afterwards? Did you have a feeling that no one needed you anymore? I knew that nobody would need me after I quit competing. There were so many examples of this happening before. So, I went through it very quietly. I didn't quit training - muscles need it. I still train four times a week. At the same time I began coaching. Then, a year ago, I got an opportunity to become a referee. Actually, first time I started to think about it was at the European Championship in 1998. I got there as a tourist but then I saw my friends, the whole atmosphere... I talked to everybody and realized that I can't just drop out of the weightlifting life like this. It's a totally different level of information, methodologies and it's a very interesting job. Actually, at first, I thought it was very easy to be a ref. First of all, it's alot of responsibility. Then, you sit there surrounded by people who know the weightlifting only in theory. I am absolutely positive that the Olympic champion Oxen Mirzoyan, World champion Vyacheslav Klokov and myself will always take the lifter's side if they make little mistakes. The ones who didn't walk in the weightlifting shoes often think that you have to be maximally strict. This is the way they are officiating. It's hard to explain these things. When you were a competitor, were the referees tough on you? Not really. I always lifted technically clean. I got punished couple of times but it was fair. How about importing forbidden medications to Canada in 1984? What do you think about it today? I would say it was a mistake of my youth. Correct me if I am wrong, but you were supposed to be banned for life. Yes. After it happened I missed two World Championships in 1985 and 1986. I was forgiven after that. What was the reason for the second disqualification when you competed in Bundesleague? I was caught on doping tests. What did you "swallow" that time? Overall, it was nothing serious. When I competed for the Soviet Union, we never faced with this kind of problems. Apparently, the Germans decided to pay special attention to me - they had two very decent heavyweights preparing for the Olympics. But I got lucky once again. I got help from the Belarus Federation and the first vice-president of IWF Nikolay Parkhomenko got involved too. So, it wasn't a long disqualification. I was out for six months. But I didn't lose a chance to compete in Atlanta. What is your impression of the recent tournaments? On the one hand, the number of participants goes up constantly. On the other hand, I wouldn't say there is a big progress in weightlifting. Any specific reasons for this? Only one - the doping control. Obviously, it's much more serious nowadays. So, the results are kinda hanging low. What is your opinion on women's weightlifting? I always said that weightlifting is not the worst activity for women. Seriously, the more I look at female lifters, the more I talk to them, the more I am amazed how responsible and dedicated they are to our sport. Trust me, men should learn from them. Women have better concentration and dedication. By the way, there is a lot to learn from women in lifting technique too. Do you compare yourself to the ones who compete today? Constantly. When a lifter (especially, the one that I know personally) prepares for the lift, my hands get wet. And I get mad that I can't help. 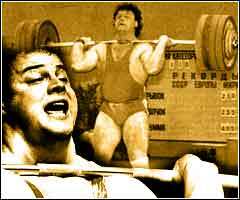 Videos and Gallery of Alexander Kurlovich is available in his section of the Hall of Fame @ Lift Up.